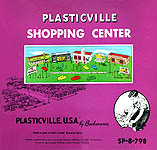 We are always looking to purchase Plasticville items along with empty boxes. If you have any of these kits, parts, or empty boxes please click on the button below to contact us immediately. 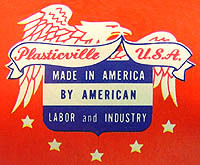 No account of the production of Plasticville is complete without a detailed list of the "Master Units" that were made. Unfortunately, any listing of these is fraught with problems and complications due to the fact that no two collectors can agree on just what exactly constitutes a "Master Unit." 1. At least one of the components of the unit had to have been issued separately under its own production number. 2. There must have been a separate box or divider to separate the component pieces within the larger master unit box. Under this definition the Suburban Station would not be classified as a master unit, even though the station bench was issued separately, because there is no separate container for this bench. On the other hand, the House & Yard Accessories Unit could be classified as a master unit because it contained a separate box that held the contents of the separately issued HF-2 Fence and Gate Unit, BS-6 Shrubs and the FR-5 Barbecue. There is very little documentation to go by concerning these units that were produced before 1950 and none from Bachmann. After 1950, even the catalogs from Bachmann were not always accurate. We have used the information from the catalogs that pertains to the contents of these units and have made notations when they were listed inaccurately. 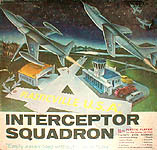 Usually, these kits were produced for only one or two years, and often the contents changed even within this small span of time. This makes it a challenge to accurately document exactly what was contained in these units. 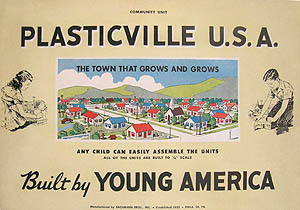 Like most "boomers" of my generation, I came to take these Plasticville kits for granted. Never realizing, of course, that change happens, and that one day these classic assortments of buildings would not be around. In the final five years of production Bachmann would begin to shift to a "generic" box with one piece of art that would allow them to change the contents for use not only with their O & S scale line, but also for their HO scale products. This was done to reduce cost amidst plummeting sales brought on, in part, by the competition from slot car racing toys. Indeed, one needs look no farther than one of the last master units that they produced, the Road Racing Accessories Unit, which is included among these units because of its historical significance. 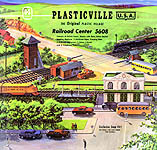 Only years later have many people realized that without Plasticville their trains had no purpose. 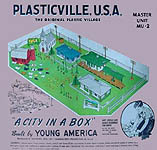 And during the heyday of post-war toy trains, that purpose was provided every year by parents who choose to give these Plasticville Master Units to their children during the holiday seasons. We’d like to express our deep felt thanks and appreciation to Sheldon Wotring, who answered my incessant questions, and provided many of the pictures of these kits. Without his assistance these pages would not exist. These pages were "born" out of sheer frustration with the lack of information that is available in the printed media concerning these units. If you have any further information about the history of, or details related to these units, we’d like to hear from you. I hope that you’ve found these pages of some benefit, and I look forward to seeing you again on the Main Street of the Plastic Village. 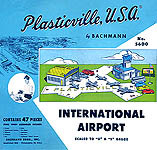 "Plasticville" and "Plasticville U.S.A." are trademarks of Bachmann Industries, Inc., a Pennsylvania corporation. 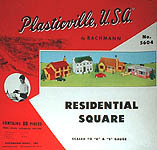 Use of their trademark symbols have been approved by Bachmann Industries, Inc., and are used with their permission. 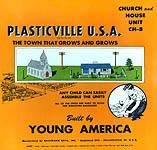 The fact that these pages have expanded over the last few years is due, in part, to the advice and assistance of many members of the PCA (Plasticville Collector’s Association). 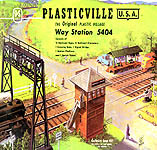 To them, and especially to Sheldon Wotring who has supplied pictures of some of the rarer Plasticville items, the editors are greatly indebted.